I spent most of the day in the kitchen - however did manage to vacuum the main level of the house. Victory! Small, but a victory none the less. Anyway, I thought I would share a couple of the things I made today. I won't necessarily share the oatmeal M&M cookies because it is a fairly generic recipe I found on allrecipes.com. It was a recipe for oatmeal chocolate chip cookies and I added the M&Ms myself. Reid, Keaton and Lyla came over and approved them for distribution at the Strengthening Families dinner at Redmond Elementry. Creekside provided the dinner so I made cookies and helped serve. It was fun. In a medium bowl, mix together the melted butter, graham cracker crumbs, confectioners’ sugar, and 1 cup peanut butter until well blended. Press evenly into the bottom of an ungreased 9×13 inch pan. In a metal bowl over simmering water, or in the microwave, melt the chocolate chips with the peanut butter, stirring occasionally until smooth. 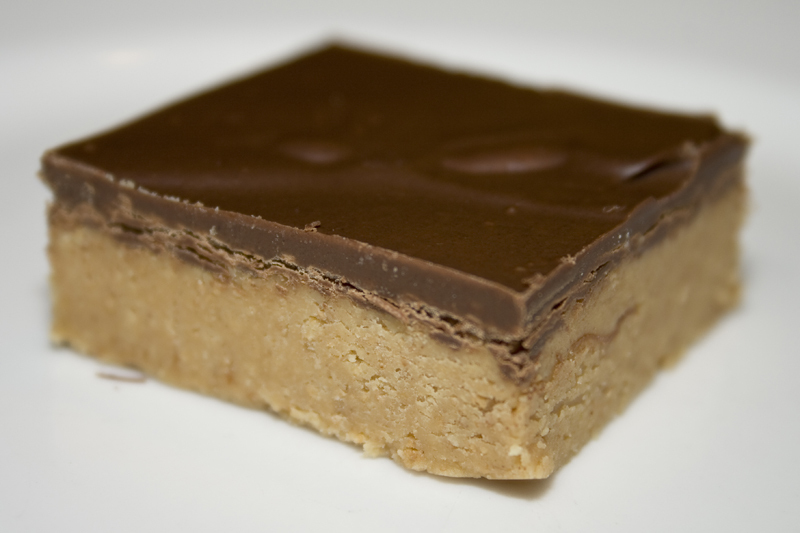 Spread over the peanut butter layer. Refrigerate for at least one hour before cutting into squares. I figured after all the cookie dough bites and spatula licking I did today, I should make something healthy for dinner. This is a recipe I found in a Cooking Light cookbook. 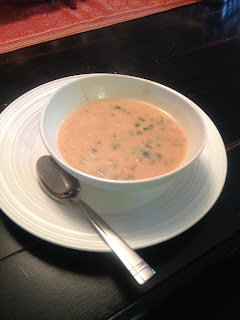 Its a light and refeshing soup that is easy to make and is good leftover. Preparation- To prepare marinade, peel shrimp, reserving shells. Combine shrimp and next 8 ingredients (shrimp though garlic) in a large zip-top plastic bag; seal and marinate in refrigerator 30 minutes. - To prepare the shrimp stock, combine the reserved shrimp shells, water, wine and 1 tablespoon tomato paste in a large Dutch oven. Bring mixture to a boil. Reduce heat; simmer until the liquid is reduced to 1 cup (about 10 minutes). Strain mixture through a sieve over a bowl, and discard solids. - To prepare the soup, heat olive oil in a large Dutch oven over medium heat. Add onion and celery, and sauté 8 minutes or until browned. Add 1 cup shrimp stock, coconut milk, and 1 tablespoon tomato paste, scraping pan to loosen browned bits. Bring to a boil. Lightly spoon flour into a dry measuring cup, and level with a knife. Combine flour and reduced-fat milk in a small bowl, stirring with a whisk. Add to pan; reduce heat, and simmer until thick (about 5 minutes). Add shrimp and marinade, and cook 5 minutes. Stir in 1 tablespoon lime rind, 1 tablespoon cilantro, and salt. The nice part about this recipe is that all the work to peel the shrimp is not completely useless since you use the shells to make the stock. Mine usually doesn't reduce down to 1 cup - only goes down about about 1 1/2 cups. I usually add some extra lime juice too for more flavor and add a little more salt than the recipe calls for.